This just in! 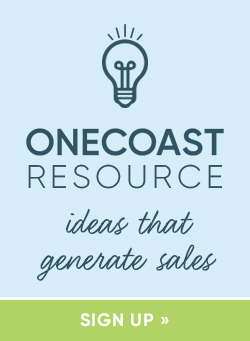 OneCoast’s 2016 Spring and Summer Vendor Highlights! Take a look below to get the inside info BEFORE our Winter Markets! 8 Oak Lane is inspired by all things current, clever, and creative. We are thrilled to bring you our Holiday ’16 offerings featuring our “Good as Gold” and “Plaid Tidings” collections. Both offer stemware and hostess must-haves that feature classic plaids, buffalo checks, and gold details; all modern updates to any table setting. Luxe faux fur and leopard will also be spotted in this collection. For Spring ‘16, we are big advocates of keeping things FRESH! Fresh fruit and gingham prints lead off our spring collection followed by our botanical story spotlighting banana leaves, butterflies, gold cane and honeycomb patterns. Products include novelty hand towels, bottle openers, trinket trays, melamine dinnerware, stemware and more. Shade Critters is a collection of fun and fashionable UPF 50+ sun protection for infants, toddlers, and kids. Our freshly squeezed 100% juicy prints lead off our little girl’s UPF 50+ collection. Highlights include those summertime fruity favorites: freshly picked pineapples and bright watermelon slices. From there we continue to expand into the jungle with our palm leaf, flamingo and just-spotted leopard prints. Our boys collection calls on the superhero trend. This season we are featuring our “My Hero” style; a clever sun protection onesie with a lightning bolt and a cape. Why not offer swimwear as strong as your superhero. For the big kids, this season we are highlighting color-block patterns with neon hits. Two trends that work as hard as they play. The specialty gift marketplace continues to restyle and change as more and more retailers are carrying a wide range of women’s accessories, jewelry, apparel and other non-traditional gift items. Recognizing this shifting market About Face Designs continues to evolve; designing and developing appropriate product types while staying true to our sentiment gift and “lifestyle” product roots. In 2015 About Face Designs added significantly to our product offering introducing many new product categories utilizing a wide range of materials and formats. These new categories generated a huge amount of excitement and were very well received by our customer base. The new “Hello World™” Collection, introduced in summer of 2015 was an immediate winner as customers loved the fashionable color palette, the gold metallic accents and the clever “affirmation” messages. More excitement is in store for 2016 as we greatly expand Hello World and introduce the new “State of Mine™” and “Office Talk™” Collections! For Spring 2016, we are pairing our favorite bold brights with airy neutrals, for a wearable spring color palette. We are bringing in novelty prints and trend right patterns in our Apparel and Accessories that truly celebrate the reason for the season – FUN IN THE SUN! Our flowy flattering fashion separates are designed to help you define your one of a kind style. Here at All For Color we can never get enough high energy color and we are excited to share our all new Spring 2016 mix & match collection. Go ahead, have some fun, mix it up! Enjoy Life in Color. Sloane Ranger is California Dreamin’ for Spring 2016. Cool and confident retro inspired prints to lift your wardrobe and your spirits! A dreamy color palette of sandy khakis, sunset corals, and tropical greens bring a fresh feel to your favorite Sloane Ranger Classics. Join the society. Never flashy, always confident. Boulevard is please to introduce our NEW Boulevard Loft! Boulevard Loft features exquisite, premium home fragrance products. The new Boulevard Loft includes 12 exceptionally fragranced gift box candles, perfect for gift giving or to enjoy yourself. For Spring gift-giving, we introduce Flutters, beautiful pastel candles with 24 karat gold butterfly and dragonfly motifs. Each is presented in a lovely organza bag and features a unique metal dust over. Vintage Hobnail is a sweet collection of colored Hobnail glasses with soft floral fragrances. Each is adorned with a botanical dust cover. Fascinate Me is His and Hers candles that are filled with the finest fragrances available. Each come beautifully gift boxed and include a box of matches. C.R. Gibson’s timeless core products are experiencing a revival with over 15 new stationery collections hitting all the paper trends for 2016. New designs range from bright graphics and soft pastels to chic combinations of black and gold. Stationery lovers are looking for that personalization factor along with humor to make a fun and bold statement to their personal brand. Our monogrammed notes along with icon journals and notepads help add a personal touch. Not only do we offer stylish new designs, but our innovative new formats add an element of uniqueness including newly engineered journals that provide a fresh approach for note takers and journalers. With trend forward designs and updated formats, our 2016 collections make a statement among traditional stationery, journals and office products. Gift givers and customers want the ability to customize and personalize their gifts. Our new program, Cup Couture, is incredibly clever with exclusive customizable gifts for less than $20! Featuring double-walled, dishwasher-safe porcelain mugs and to-go cups, each brilliantly designed and delightfully accented with a removable ceramic charm. Interchangeable hand-washable charms are also available separately for endless mix ‘n’ match versatility giving your customer the ultimate ability to find the perfect combination for their personal gift giving needs. Bright and bold colors are making a huge statement among design trends for 2016. With kitchen space design still trending neutral, kitchen accessories offer opportunities to add pops of color, personality and fun. Our new kitchen collections and paper tableware feature colorful designs with fun and bold graphics. With the return of iota founding designer Kelly Alford, whimsical patterns and bold color return for signature iota designs in 2016. Iota introduces two new design collections, Mosaic and Flock of Colour, both reflecting the patterns and colors from the Iota archives with a fresh new twist. Along with new designs come functional formats in both the iota chic accessory line and iota stationery. The triple bag set features 3 bags in 1, all offering their own unique function with a canvas tote, laptop pouch and patterned wristlet. Adding to our fun stationery collections, new iota stationery formats include the iota note writing survival kit which helps make writing fun again! This kit comes packed with colorful postcards, note cards, self-mailers and even sheets of stickers to put the finishing touch on your special note. With the popularity of baby products continuing to dominate the retail world, C.R. Gibson continues to add to our extensive baby brands and collections with trend forward designs inspired by an array of motifs from the modern to the retro. 4 new baby collections including books and gifts along with 14 returning collections hit all baby trends for 2016 from bright colors, neutral gray, pastels and modern prints. Our boutique baby brand Baby Dumpling continues to expand with two new collections along with an addition of booties and paci-clips. New Willow Tree® sculptures offer expressions of love. Willow Tree artist Susan Lordi continues the look of her successful 2015 Signature Collection in her new 2016 sculptures. Using techniques of hand-applied gold embellishment, Susan pushes forward with new directions and formats, yet maintains a cohesive brand look. Her new pieces communicate a common theme of love… romantic, comforting, timeless, and patient. Duet is a special gift for lovers on Valentine’s Day. Vigil and Tapestry are two new remembrance pieces, different from each other in scale and form, but similar in intention and feeling. Patience will be a thoughtful gift for mothers and caregivers. Exclusive companion products for popular children’s books introduced. DEMDACO is thrilled to introduce exclusive collections of gift products inspired by two popular children’s books. The New York Times Bestseller The Christmas Wish by Lori Evert and Per Breiehagen is a heartwarming story of a child who sets out on an adventure to make her dream of helping Santa Claus come true. The Christmas Wish Collection features gifts and decorative accessories that reflect the popular book’s delightful characters and magical adventures. The Nancy Tillman Collection of precious plush toys and beautiful keepsakes, including frames, figurines, a growth chart and a soft story, captures the “You are loved!” message of the beloved children’s book and New York Times Bestseller, On the Night You Were Born by Nancy Tillman. Sweet and chic products bring smiles for Mom and baby. DEMDACO continues to celebrate youth and family with new heirloom-quality toys, gifts, and functional products for Mom, baby and home. New bag designs expand the successful LillyBit® collection of functional baby-bag accessories for fashionable moms. In addition, fresh designs and fashionable materials bring upscale, contemporary appeal to a variety of new assortments of plush toys, home décor and giftable keepsakes for baby. Creative products inspire traditions and make memories all year long. Bedtime is the best with a happy place to rest your head and a creative, new concept in bedding accessories from DEMDACO is certain to have kids jumping into bed. The Hit the Hay! Collection features playful pillowcases decorated with delightful imagery and phrases in holiday and everyday themes that will inspire family traditions and make memories at sleepovers. In celebration of special occasions throughout the year, DEMDACO continues to provide customers with stylish new decorating, entertaining and gift-giving products that cater to today’s trends and wish lists. Artisan designs offer one-of-a-kind personal expression. DEMDACO appeals to a woman’s desire for personal expression by expanding her fashion choices with trending apparel and accessories. The sophisticated new Soul to Sole™ collection features unique fashion socks decorated with colorful and artful designs by popular industry artists. In addition, new artisan-designed scarves, bags and jewelry offer one-of-a-kind fashion treasures. Home and entertaining gifts celebrate relationships in style. Steadfast in the mantra to lift the spirit and connect people in meaningful ways, DEMDACO introduces several new giftable products that lend a personal touch to hostess gifting and home décor. The sophisticated Uncork and Unwind™ collection takes the wine gift bag to the next level with finely crafted, multi-function wooden pieces that are a trendy lit home décor accent that double as a stylish container for delivering the gift of wine. Fresh artistry captures our love of nature. DEMDACO brings the beauty and joy of nature to our living spaces inside and out with delightful decorative accessories and inspiring gifts. The fashionable new Artful Reflections collection features beautiful artist-designed imagery of nature paired with uplifting words of inspiration in handsome pieces of glass window and wall décor. Handsome new copper mule mugs from the Big Sky Carvers® Lodge Living collection tap into the trending popularity of Moscow Mules in home entertaining accessories. Jane Marie is about creating personal connections through our unique, heartfelt charms and necklaces and our vintage chic collections of bracelets. Let your personality shine through our collection of fashionable tassel necklaces, mixed metals and textures, natural stone bracelets and more. Ladylike pearl initials are a must have and you will love Jane Marie’s spin on this classic look. Bold color combinations add spice to every outfit. Layer our necklaces, different lengths and styles create a look that is right on trend. Stack bracelets from various collections to form a look all your own. Statement earrings are trending this season and we have styles to complete your signature look. Customizable necklaces and bracelets allow you to express yourself. Each piece is designed in the U.S. to make it a one of a kind gift for yourself or another, one that is sure to charm. Mad Style is back with a vengeance for Spring 2016. Bold new fashion introductions with free flowing tops and hip capri leggings embellished and inset with lace, the hottest textile for Spring. Mad Style maintains its emphasis in Mad Man with notable men’s pendant necklaces and Stainless steel rings, and expanding on the already successful watch and accessory categories. We stay committed to introducing the latest handbags in fashion colors as well as staying on top of the trend with electronic accessories such as charging purses and phone wallets. Mad Style is thrilled to be introducing three new categories to our brand that are already creating quite the buzz. Mad House, an affordable line of trendy and functional home décor. Mad Motion, our response to the ever growing trend of Athleisure wear tailored to the needs of the gift market. Last but certainly not least is our first philanthropic venture, Mad Dog. Our very own line of Upcycled dog toys and t-shirts supporting Alive Rescue, A no Kill Shelter in Chicago. Mad Style is your one stop shop with the latest and greatest equipping your stores with assured retail success. Elly Spring/Summer 2016 is all about color. We have taken the hot fashion colors for Spring and incorporated them into several different categories while staying committed to our use of semi-precious stones, crystals and fresh water pearls. Brand new to Elly is a designer inspired line of Sea Glass jewelry handmade with authentic sea glass and uniquely embellished with delightful charms. Additionally, we have an exciting introduction of island inspired jewelry in bright Spring colors, accented with tassels and fringe. Seasonal staples have been updated and refreshed with new elements and materials. Two new exciting categories for Elly are stunning fashion belts with gorgeous buckles, and an Eco-Friendly line of handmade Bamboo handbags which round out this Spectacular Spring 2016 introduction. Stylish and smart, Mud Pie Living is perfect for entertaining or for gifting. Our designs inspire celebrations – holiday parties, birthdays, baby showers, bridal showers and seasonal festivities. Shop Mud Pie for home décor, serveware, entertaining pieces, spreaders, bar accessories, giftable mugs, cutting boards, decorative hand towels, frames, photo albums, personalized items and coastal themed merchandise. Mud Pie develops distinctive baby & kids products that are a joy to give and to receive. Designs range from fun and whimsical to chic and sophisticated and are sure to inspire oohs and ahs. It’s the special details, finishes and packaging that set Mud Pie apart, especially at the price point. Keepsakes, layette, shower gifts, toys and banks, fashions for little girls and boys, hair accessories, sun hats, specialty socks benefiting the March of Dimes, inspirational and holiday themed items are all part of this season’s collection. Mud Pie’s Fashion appeals to a style-driven, value-conscious customer. Mud Pie is classic, with universally flattering silos that mimic high-end design in both aesthetic and quality that require minimal styling. We offer solids in all apparel categories in pop and classic colors. The Spring 2016 collection is filled with preppy prints along with new executions of embellishments and dense embroideries, yarn-dyed fabrics; stripes, seersuckers, and chambrays. Mud Pie accessories style effortlessly with our apparel or make fantastic statement pieces. At Studio M (formerly Magnet Works) we are dedicated to creating unique, artful products for the home and garden. Each season, we collaborate with talented artists to bring you and your customers the best designs in the industry. From mini garden items and garden flags to Art Poles and Art Pots, there is something new in every category for spring and summer 2016! Kaleidoscope is an exciting new collection designed by artist Carol Roeda. The carefully crafted design of the line’s dimensional, kinetic sculptures allow each one to respond to subtle changes in the wind. Each sculpture is made of a heavy-gauge metal that won’t fade or rust. Kaleidoscope’s bright pops of color and hand-painted details will turn any outdoor space into an art gallery. January marks the launch of two new garden collections for spring and summer! Each includes coordinating Art Poles, BreezeArt flags, Art Planters, MatMates, and more. Capistrano, designed by artist Jennifer Brinley, is full of her signature bold florals, brightly colored butterflies, and rich textures. Signs of Spring, by Susan Winget, is an artful blend of the newness of spring and the weathered, worn look of vintage elements. The mini garden category has done nothing but grow over the past several seasons, and Studio M’s offering has expanded right along with it. We are thrilled to announce the launch of a brand new miniature gardening line, Merriment, designed by Mary Engelbreit. This adorable collection stars five fairies, each with their own unique interests, hopes, and dreams. Unlike traditional woodland or pixie fairies, Merriment’s fairies are relatable, contemporary characters that are full of personality. The line also features charming animals and accessories to create a mini garden that is full of fun! With bright colors and classic patterns, this is a collection you just won’t be able to get enough of. Our wildly popular Gypsy Garden collection took the industry by storm when it debuted in spring 2013. This mini gardening line continues to grow each season and has more than tripled in size. There are many exciting new themes like county fair, lake, and gypsy/boho. New items include a dock, rowboat, Ferris wheel, and lots of new animals like ducks, goats, and sheep! At markets in January, Studio M will release four new Custom Art Poles as an expansion to our popular Custom Address Poles. Now you can offer your customers something truly personal and special with this collection of special-ordered, custom-made poles. Designed by Stephanie Burgess, themes include family, marriage, patriotic, and more! This season, we will debut 12 new Greek-themed Art Pots featuring the name, colors, and Greek letters of different sororities. With fashionable graphic prints and bright colors, these 6” pots are the perfect gift for Bid Day or for alumnae! With exciting patterns and colors that will stay vibrant for years, Art Planters are the most unique and beautiful planters on the market. This season, we have more than doubled this collection, which now includes over 75 Art Planters designed by 14 artists. New for spring and summer, each planter set now has a coordinating MatMate for a truly remarkable front door greeting! Woodstock Chimes are the original, musically tuned, high quality windchimes. Created by GRAMMY® award-winning musician Garry Kvistad, they are tuned to beautiful melodies and scales from around the world. Woodstock Chimes’ products have been the choice of discerning customers for over 36 years. While chimes are the heart of our business, we are also the source for the award-winning Woodstock Music Collection, fun and colorful instruments for children of all ages, the popular Woodstock Rainbow Makers™, stunning crystal suncatchers that do for light what our chimes do for sound and DCUKs, handcrafted from sustainable materials, each has its own name, pose and personality. Over 35 new product introductions in January build upon our best-selling trends over the past several seasons. Beautiful tunings, coastal themes, plenty of color and many more Rainbow Maker suncatchers are all available at the winter markets. Our customer care staff and professional territory managers will help you develop the order that’s best for your selling environment. 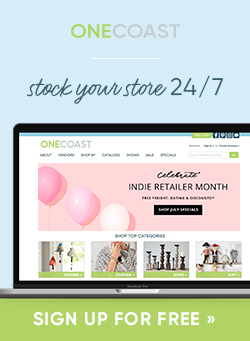 Share the post "OneCoast Vendor Highlights for Spring & Summer 2016"